19 Dec Space & Housing: Are chickens crammed in houses? Do chickens have enough space to move? Chickens are not “crammed” in houses. Broiler chickens (chickens raised for meat) live in growout houses, which – as their namesake implies – provide enough space for chicks to literally “grow out” into full sized chickens. In fact, the houses are built in a way that each bird can eat, drink, rest and move around freely. By nature, as the old saying goes, birds of a feather tend to flock together – a behavior that can sometimes give the impression that the birds are crowded, when in fact they’re just following their natural instincts. If chickens did not have adequate space to move around, then they would not be able to eat and drink – and ultimately go to market. Not only is adequate space for each bird a basic welfare requirement, but it is also in the farmers’ best business interests for their birds to have space to grow and go to market – so that they can earn their living. How much space do the birds have in an average chicken house in the U.S.? According to the National Chicken Council’s Broiler Welfare Guidelines, birds must have space to express normal behaviors such as dust bathing, preening, eating, drinking, etc. The number of birds in a chicken house (also known as “stocking density”) is based on a few factors, including the overall size of the barn, the size of the equipment in the house, and the target market weight of the birds – and is measured to ensure that chickens when fully grown have space to access fresh water and feed throughout their life. It’s important to note that no broiler chickens are raised in cages. As the birds age, they grow into this space. When baby chicks are first delivered to the farm, they are small (about the size of baseball). In fact, because they are so small, farmers have to section off parts of the house so that the baby chicks don’t stray too far in the house! As the birds grow larger, they start to fill up the house. It is not until the birds reach market weight (around 7 weeks) that they fill up the space of the growout house. The birds are only at this size for a few days, and then they are transported for processing. Why do farmers raise so many chickens at a time? It’s true, 20,000-30,000 chickens is a lot of chickens! Advances in farming and technology have allowed farmers to raise more chickens and keep up with consumer demand (chicken is the #1 protein consumed in the US). In addition, raising more chickens in one space has not only helped make chicken the affordable and accessible protein that it is today, but it has greatly reduced chicken farming’s environmental footprint because it makes farming more efficient and streamlined. Why are chickens raised inside? Isn’t it better for chickens to be raised outside? 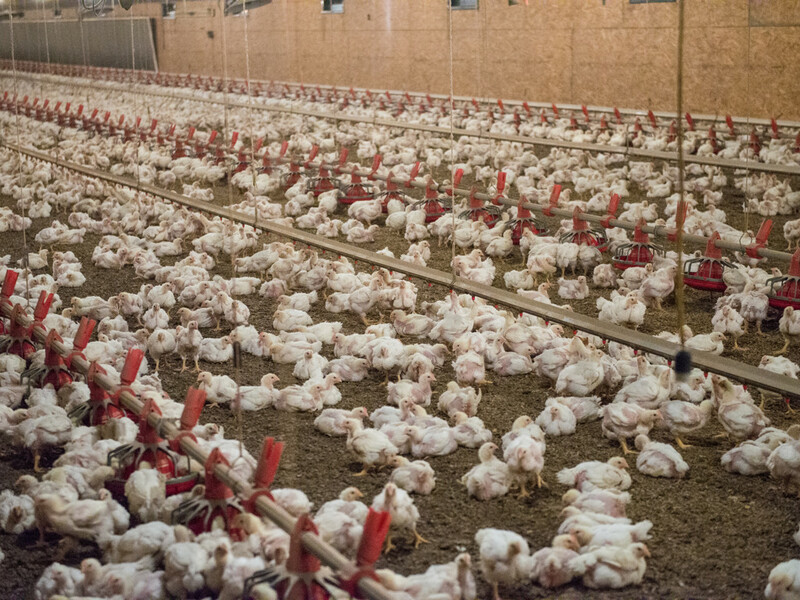 The majority of broiler chickens in the U.S. are grown in enclosed barns, also known as growout houses, to keep the birds safe from extreme weather, predators, insects and the possible introduction of diseases, like bird flu. Having an enclosed shelter also gives chickens a strong sense of security. Broilers are grown on loose litter (which can be wood shavings, rice hulls, or some combination of plant materials) and can freely move within the enclosed barn. Consumers have choices when it comes to how their chicken was raised. Free range chickens have some degree of access to the outside, and some chickens are raised outside on pasture. In most cases these birds are brought inside at nighttime to keep them safe from foxes, coyotes, etc. One system is not “better” than the other. Each have different challenges when it comes to the health and safety of the chickens, and the safety and affordability of the product. To download a PDF of this FAQ on broiler chicken housing, click here. For an inside look at chicken houses, visit our Day in the Life videos.